Australian mobile retailer MobiCity now has the Samsung Focus 2 Windows Phone available unlocked for the price of $AUD 649.00! 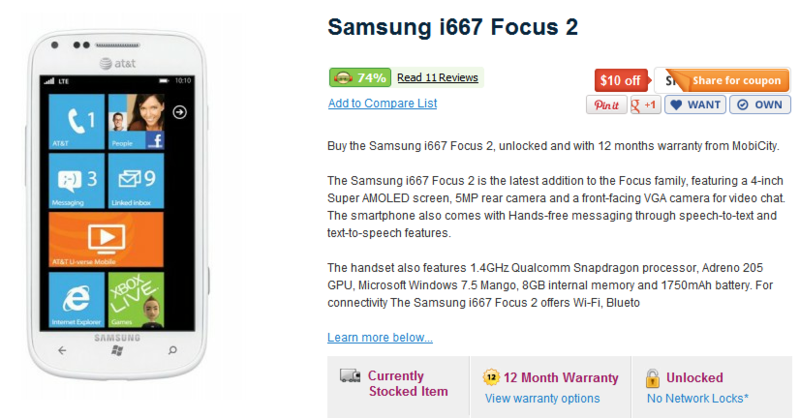 The unlocked Focus 2 available through MobiCity includes a standard 12 month warranty and is currently in stock. Also of note, the only available color is white, and a option free endless SIM starter pack is also available with purchase. With your MobiCity Focus 2 purchase, here is what you are buying: Unlocked phone, Battery, Original charger, Adaptor plug, Australian wall charger, and Wired handsfree. Supported network bands: GSM 850, GSM 900, GSM 1800, GSM 1900, 3G 850 (NextG/Vodafone 850/US3G), 3G 900 (Optus YesG/Vodafone), and 3G 2100. Recommended networks: Optus 2G, Vodafone 2G, Telstra 2G, Optus 3G 900, Optus 3G 2100, Vodafone 3G 900, Vodafone/Three 3G 2100, and Telstra/Voda NextG 3G 850. As a reminder, the Samsung Focus 2 Windows Phone boasts a 4″ Super AMOLED display, 1.4 GHz processor, 8 GB of internal storage, a front-facing camera, and a 5MP rear facing camera. 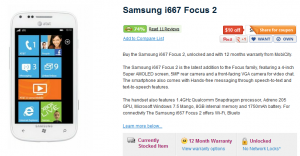 For more information and to place your order visit the Samsung Focus 2 MobiCity product page. i bought sam sung focus 2 but i cant use it in Kenya Africa what can i do love the phone i cant return it. what do i do with it? it is locked. i already have sam sung focus 2 SGH-I667 HERE in kenya africa its locked i really want to use it here? what do i do ? how do i unlock it?